OpenTable (yet again) led me to this 1,000 point reservation at Stephie’s on Tremont in the South End. I’ve been to its sister restaurant Stephanie’s on Newbury a few times, many years ago, but haven’t returned as it tends to be typecast as the (expensive) “place to be” on Newbury. The menu style remains the same between the two and the food items are actually quite similar; what sets these two apart is the atmosphere & ambiance, type of clientele, and (slight) price different. 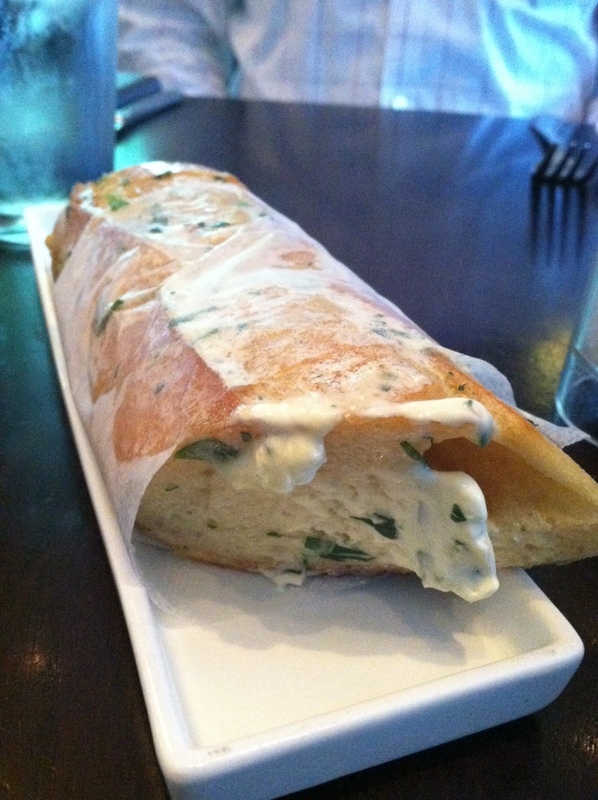 Bread: This sliced loaf of warm bread was wrapped in paper and smeared with herb butter. It was a bit messy as the top of each piece was covered in melted butter, but it wasn’t overly buttered so I wasn’t complaining. 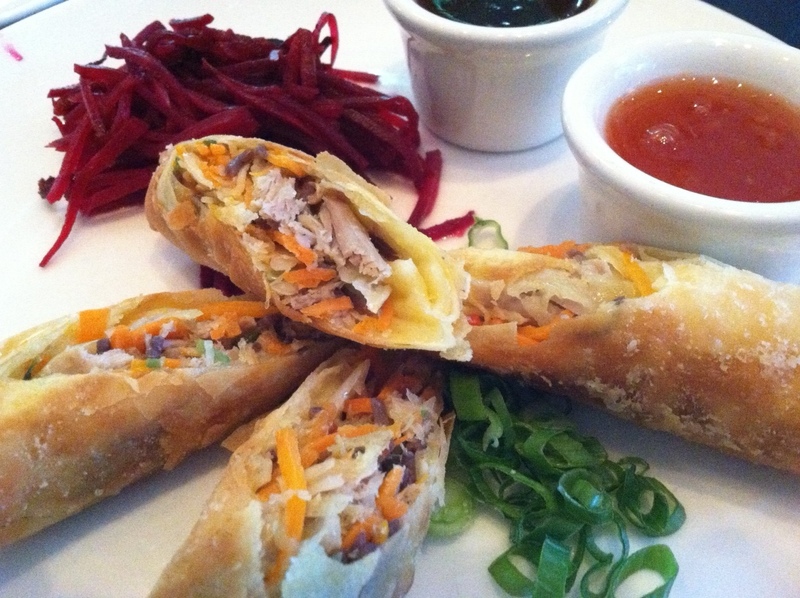 Menu: The dinner menu consists of Appetizers, Signature Salads, Comfort Food Classics, Dinner Specialties, and Sides. A couple of the entrees looked enticing but I wanted to dabble in a few different plates so I went with an app, salad, and side to share. Four spring rolls came next to diced scallions and what I believe was shredded pickled beets. Matt & I were really excited for this app but it was just ok; the sauces weren’t bad but the actual rolls lacked flavor and needed more duck meat. What a salad! 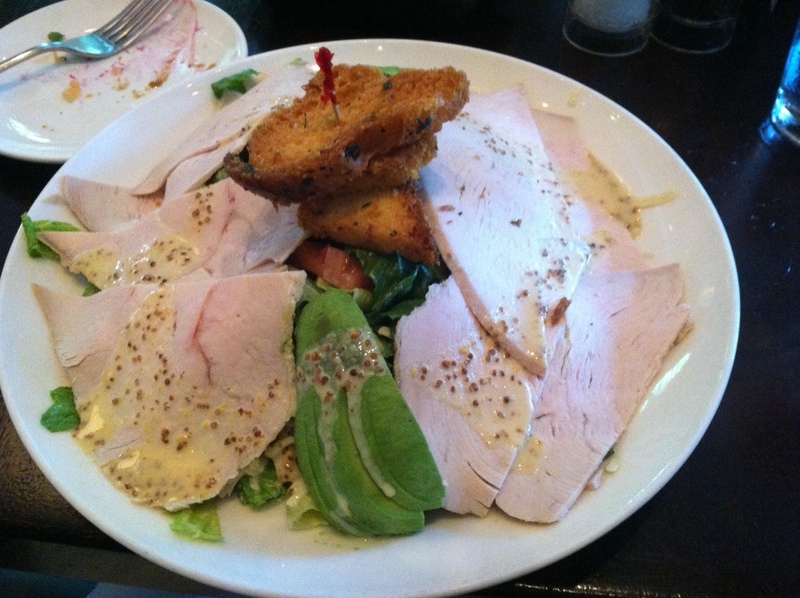 From what I first saw, the lettuce was topped with thick slices of roasted turkey, ½ an avocado, croutons, and was drizzled with mustard vinaigrette. After slicing and chopping away this salad really came together. The vinaigrette was amazing (I’m obsessed with mustard – except yellow mustard, waste of time!) and I could have bought a case of the dressing on the spot. 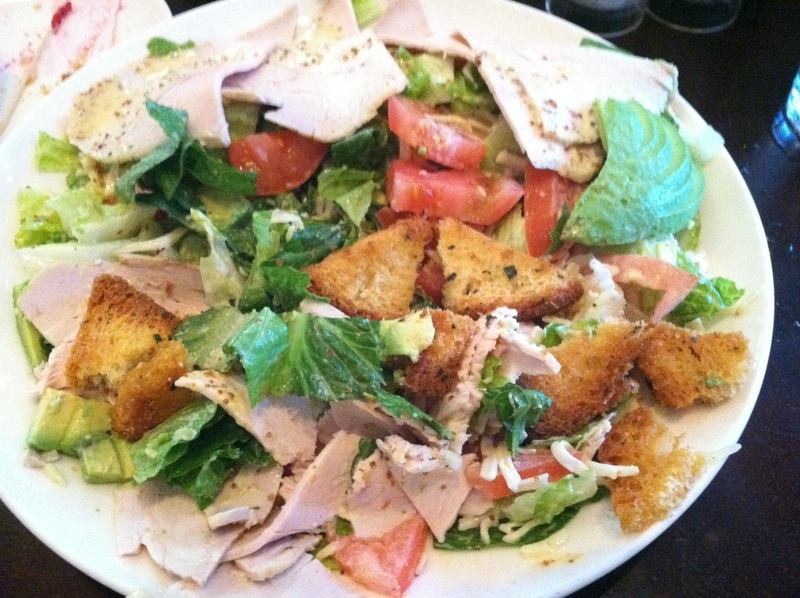 The salad itself was large, hearty & healthy, with a lot of flavor and substance. Really excellent. I know “salads” can be boring but I’d order this again in a heartbeat. FYI, this salad is originally served with bacon for all you piggie lovers out there. A pile of thin cut hot fires came in a cast iron dish topped with sprinkles of parmesan. I didn’t really see or taste the rosemary, which is the part I was most excited about. But I adore thin cut fries and these were pretty good with the perfect amount of crisp & crunch! 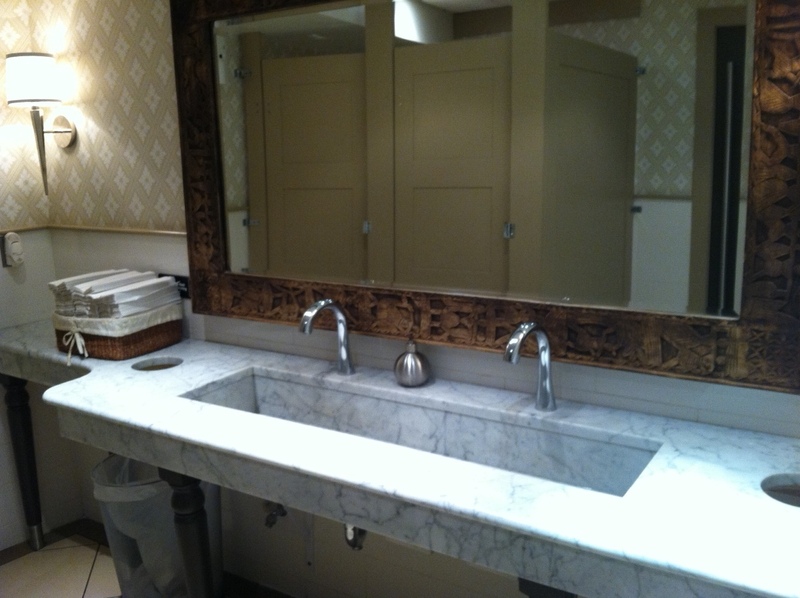 Bathroom: The restroom was nice with a marble countertop, trough-type sink, oversized mirror, subdued earth tones, and 2 stalls. Nothing necessarily stood out but it was clean and had automatic faucets! Service: One thing that Matt loved is that our bread came out before we placed our order. Typically most restaurants wait to deliver the bread until after people have decided on food; I figure they want people to remain hungry and order appetizers, so they wait to bring the bread until after everyone has chosen their apps/entrees etc. Either way doesn’t matter to me, I just want the bread, and I want it to be warm & delicious! Overall: Stephie’s on Tremont certainly has a more casual, laid back vibe compared to its sister spot on Newbury Street. Prices are moderate with apps & salads ranging $8-$19 and entrees $15-$27. Stephie’s has a long bar with multiple TVs and a dining room with a majority of banquette seating. I may not rush back (since I’m always looking to try something new) but with their outdoor patio and great food I’d suggest you give it a shot if you haven’t already. 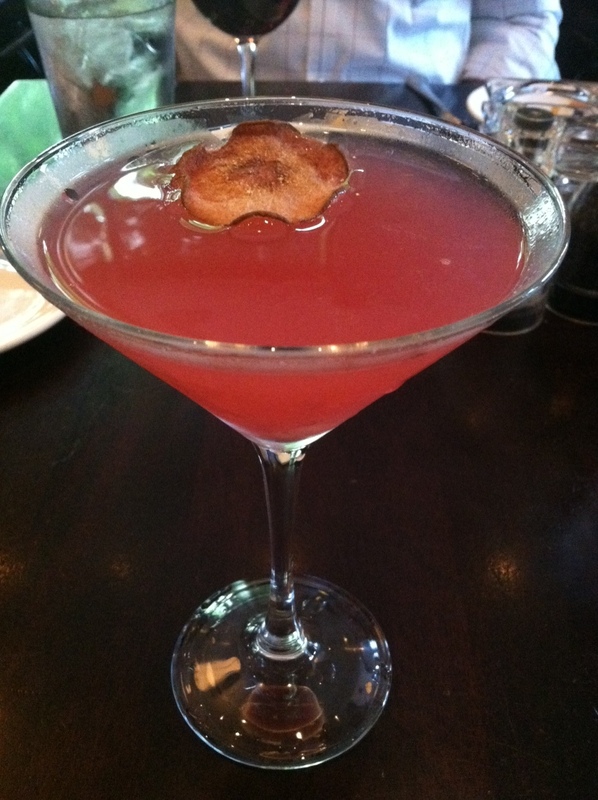 They also have a decent cocktail list, including this Spiced Pear Martini. The Perfect Bite: Salad with turkey, avocado, and mustard vinaigrette. The leftovers were amazing as well! 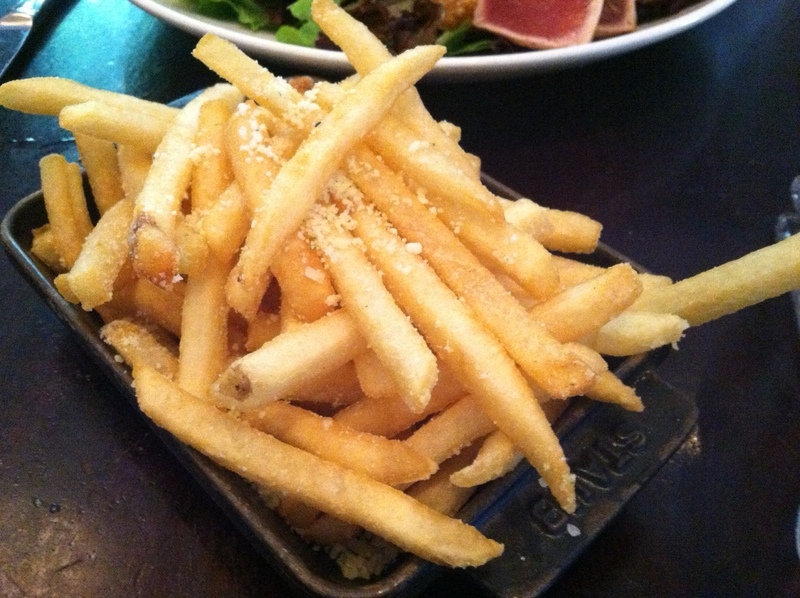 This entry was posted in South End and tagged duck confit, parmesan fries, turkey salad by Dena Raffa. Bookmark the permalink. First off, thanks for visiting my blog! I started “The Perfect Bite, Boston” over 3 years ago so have had a lot of time to build up content. It all started after I got laid off from the advertising company is was working for. I unfortunately had some new free time on my hands and had always been passionate about food / restaurants, so I started the blog to document my restaurant experiences. It started as a fun hobby and now has become what feels like a fun 2nd job. I take the photos and blog content seriously and want the presentation to be just right, so writing 1 blog entry does take a good amount of time, but if you’re writing about something you’re passionate about then it never feels like work. In terms of suggestions or tips, just have fun with it! I try not to stress too much the vocabulary or sentence structure; after all, a blog is meant to be personal and less formal.